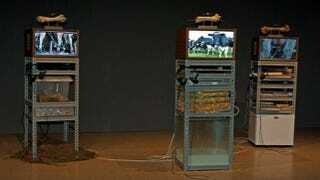 Boo Chapple, an artist, has made audio speakers out of pieces of cow femur. To do this, she exploits the same property that puts crystals in watches and ceramics in microphones, which is an intrinsic part of bone structure. Find out why your entire skeleton is wired for sound. An Australian artist decided to make an audio art exhibit that could have been part of the set of The Texas Chainsaw Massacre. All around the exhibit, television sets showed footage of things that make low-frequency noises; cows. Instead of being hooked up to speakers, the televisions were hooked up to bones. Put a stethoscope to the bone, and it would allow you to hear a song about cows and vibrations. The bones weren't being vibrated. They were merely being zapped with electricity. The bones themselves transformed the zapping into sound, via a physical property known as piezoelectricity. Piezo means "push" in Greek. When piezoelectric materials get pushed out of shape slightly, they create an electrical charge. And when a charge goes through them, they slightly change their shape. In watches, piezoelectric quartz crystals are used to keep the time, since they oscillate a precise number of times each time they get zapped. In microphones, including the ones in telephones, they translate vibrational sound into an electric charge that can travel through wires. Why do bones have piezoelectric properties? It probably helps with healing them, scientists say. Piezoelectricity seems to be part of the collagen that keeps bones from being brittle and breakable. The more stress that a bone receives at a certain point, the more it builds up. Piezoelectric signals from areas that feel a lot of impacts during the day could cause the body to build up, or heal, that area of the bone. Whatever the reason, it appears that our entire skeletal system is a natural transducer, meaning a material or device that changes energy from one form to another. And our bones are electric-mechanical transducers, which is why they can be wired for sound, as they are in Chapple's art exhibit. Every compression of bones causes electric signals to pound through the body, and every electric shock to the system literally rattles the bones. Via Scientific American and Hyperphysics.